In partnership with The Technical Centre for Agricultural and Rural Cooperation (CTA) and the Panafrican Farmers Organization (PAFO), Global Open Data for Agriculture & Nutrition (GODAN) has published a new discussion paper called the Data Revolution for Agriculture on how open data can empower small-scale farmers.
" With the emergence of low-cost, readily available open data, knowledge is no more the privilege for a few, but a right for everyone… a tool that can enable everyone to tap into global intellectual capital” (Foreward by Andre Laperriere, GODAN Executive Director). “In one way or another the concept of open data – especially in agriculture, is going to be answering some big questions about the future of global food security, and undoubtedly the benefits of data-sharing in agriculture are most keenly felt by farmers and rural communities”(Namibian media picks up on Forum for Open Data). However, the real challenge lies in ensuring that access to quality data is widely available and linked to local solutions for improving food security and nutrition” (Data Revolution for Agriculture). through information” (Foreward by Andre Laperriere, GODAN Executive Director). 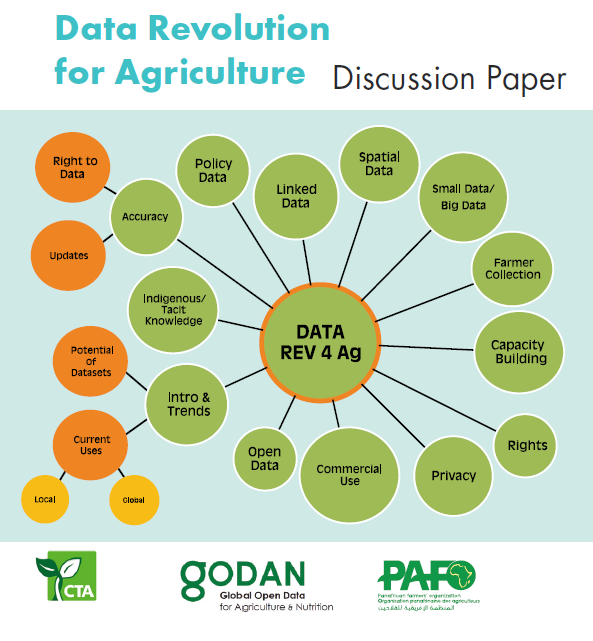 The Data Revolution for Agriculture discussion paper has been produced jointly by the Technical Centre for Agricultural and Rural Cooperation (CTA) and the Global Open Data for Agriculture and Nutrition (GODAN) with contributions from the Pan African Farmers’ Organization. In particular, the paper is based on CTA’s extensive hands-on experience working with small and mediumscale farmers in the most remote corners of the world and encompasses a series of studies, reports, and background documents previously produced by CTA on the potential impact and use of agricultural open-data policies and practices across the ACP region. the paper stresses that open data can transform the lives of rural populations, stimulate economic growth and in turn, lead the world ahead of the food security challenges ahead of it. The Executive summary comprises the definitions of the following key concepts: Open data, Closed data, Shared data, Data devolution, Real-time digital data, Big data also called the Five Vs. Afterwards the common features of big data for development are introduced. These data could/should be: digitally generated, passively produced, automatically collected, geographically or temporally (time-related) trackable, continuously analyzed. The Executive summary explains also the concept of Data blending method, which is used to extract value from multiple data sources. This process can also help to discover correlations between different data sets without the time and expense of traditional data warehouse processes. For instance at CTA, the documents’ collection is linked to the Food and Agriculture Organization (FAO) AGROVOC system for keywords and geocodes for places to help people navigate through CTA’s collection of nearly 50,000 documents online. introduces the reader into the open data concept and explains why data (and different data types) matter. The data revolution concept is shaped with a view both to sustainable development goals (SDG) and to private, open and big data for agriculture. According to FAO (2009) estimates, to feed a world’s population of 9 billion in 2050, food production will need to increase by 70%. In this scenario, accurate agricultural information is essential for achieving sustainable agriculture and food security. provides an overview of data for: policy, agricultural development (knowledge problem in agricultural statistics, knowledge and governance problems, data revolution in African agriculture) and for investment. Moreover this Chapter focuses on the potential impact of open data on the smallholder, the connection between agricultural open data and ICT tools, implications for big data in agriculture (the leading role of the private sector and potential benefits for small-scale farmers), and precision agriculture. When promoting the use of open data in agriculture and rural development, it is important to adapt a driven, inclusive process allowing the full engagement of local communities and the creation of new businesses for a broad range of stakeholders. Finally, the Chapter presents some samples of sources of agricultural data (agricultural census enumeration areas, farm registers from the agricultural census, farm registers based on administrative sources such as business registrations or tax collections, area sample frames), and explains how participatory data can help communities to build datasets. describes the following issues and challenges around data: data quality, governance , protection and privacy, data disaggregation, cyber security risks, digital divide and capacity development, data rights, timing, data usability. “The quest for open data described in these chapters demonstrate not simply how the world will better feed itself, but how everyone’s quality of life will be improved in the process. CTA’s approach to open data is one of an advocate, but a critical one, emphasizing the need for wisdom and discernment. For a sustainable and most beneficial development of our collective agricultural future, we must together strive to make sound and relevant data available, understood and put to use. That is the challenge proposed in the Data Revolution for Agriculture." (Foreward by Andre Laperriere, GODAN Executive Director). 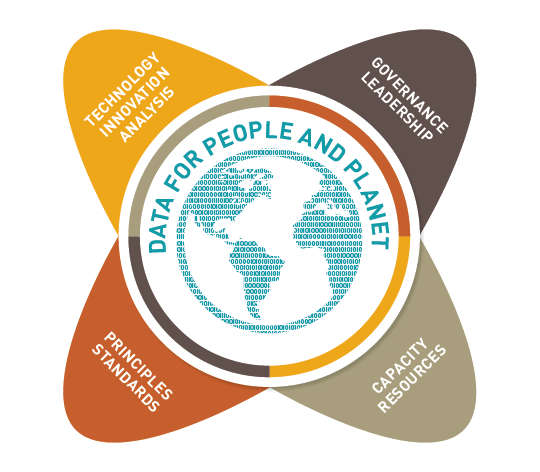 “the data revolution can be a revolution for equality ... mobilizing the data revolution for achieving sustainable development urgently requires such a standard setting, building on existing initiatives in various domains .... open data and digital rights management and licensing”(Data Revolution Report, 2014). “Only 2 out of 44 countries in sub-Saharan Africa are considered to have high standards in data collection… Instead of writing large grants, spending days travelling to remote field sites, hiring and training enumerators, and dealing with inevitable survey hiccups, what if instead you could sit at home … and, with a few clicks of a mouse, download the data you needed to study the impacts of a particular program or intervention?” (The Data Revolution for Agriculture paper, 2016). Who really benefits from the opening of data, also with regards to sustainable development (in agriculture)? How to ensure that people, organizations and even governments are not left behind or even excluded from the data revolution? If you have a story to tell or experience to share about improving nutrition and agriculture with open data, register on AIMS portal and submit your idea, add your comment or write your thoughts!